The Clay Court is a tennis court that appears in all Mario Tennis games. In Mario Tennis for the Game Boy Color and Mario Tennis: Power Tour, it is where the senior-ranked players play. Alex, Nina, Clay and Ace also play here to try to advance their way to varsity-ranked. Its ground is an orange-like color in all games. It has a slow speed and weak bounce, making a harder court to play on. Defensive or fast characters are put to a slight advantage due to their statistics. The Clay Court makes its first appearance in the Nintendo 64 title, Mario Tennis. The court is a brown color and has a slow ball speed and weak bounce, setting the standard for all subsequent Mario Tennis games. The Clay Court appears for a second time in the Game Boy Color version of Mario Tennis. It acts and looks the same as the 64 version and is used by the player (Alex or Nina) in story mode to beat the senior ranked players to move on to the varsity ranked. In Mario Power Tennis, the clay court appears in Peach Dome. When choosing this court, it is mentioned that the ball travels slowly due to weak bounces off the court. The Clay Court once again appears in Mario Tennis: Power Tour for the Game Boy Advance, acting the same as all previous games and being used in the same way as it was used in Mario Tennis for the Game Boy Color, acting as the court used for the senior-ranked players. In Mario Tennis Open, the Clay Court appears in Mario Stadium. Like the other clay courts, it has a weak bounce with slow ball speed. The Champions Cup semifinals happen on this court. The Clay Court appears in Mario Tennis: Ultra Smash as one of the nine courts available. The ball travels slowly and bounces weakly, as the Sand Court makes the ball travel very slowly and bounce very weakly. It is described as a court "Covered with clay, giving a ball speed slower than the hard court." 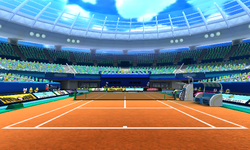 The Clay Court returns in the tennis mode of Mario Sports Superstars and is used in the Star Cup. It features low bounce and low ball speed, similar to previous installments of the Mario Tennis series. This page was last edited on May 28, 2018, at 15:47.